Pirates of the Caribbean has always been one of my favorite rides and this year I was really looking forward to seeing it again after its long refurbishment. (due mainly to the movie) Knowing I would be going on this attraction right after the reopening I had decided not to read any information online about the changes that were happening… especially the changes involving the characters from the movie. I wanted to go on this attraction with an open mind and am happy to say that I was able to do that. My first ride on Pirates was alone because our son had to go to the bathroom while in line so I was able to experience everything on my own. I was instantly impressed with the new sound quality of the attraction. I had actually heard that the sound was being upgraded and it was noticeable from the beginning. It was also quickly apparent to me that while some changes were made, the gist of the attraction remained the same; and that the inclusion of the movie characters simply enhanced the storyline for the ride. Gone are little problems with the animatronics. Everything is clean and fresh. I will not give away all of the secrets of this ride and spoil it for those who have not yet had the opportunity to ride. All I will say about the changes are that they are wonderful and very well integrated into. Captain Jack Sparrow looks very nice and moves much like his character in the movie. 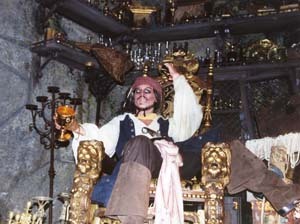 Barbossa and Davy Jones were added to the attraction in a wonderful manner greatly enhancing the ride. All of the changes fit in perfectly and are thrilling to see. Pirates of the Caribbean has not been ruined with these changes. In my opinion it has been greatly enhanced. Now the ride actually tells a story guests can follow. You don't need to be familiar with the Pirates movies to love the ride as it will stand on its own. For those who do love the movie, the refurbished ride is a wonderful treat. So when at Disneyland hop on your boat and enjoy the ride. I agree with you! The new features just enhanced the ride. I don't understand why people are so upset that they changed it.